Dutch Finance Minister Jan Kees de Jager yesterday debated the Spanish bank bailout with MPs. Among other background documents, the Dutch finance ministry published on its website a 'confidential' briefing prepared by officials at the eurozone's temporary bailout fund, the EFSF. The document reveals a couple of interesting additional details about how and when the money will be paid out, which were not included in the draft Memorandum of Understanding leaked to the Spanish press earlier this week. As announced by Eurogroup chairman Jean-Claude Juncker after Monday's meeting of eurozone finance ministers, the first tranche - worth €30 billion - will be disbursed before the end of July. However, the EFSF briefing makes clear that this is not a fully-fledged payout, since this money will be "kept in reserve by the EFSF in order to allow rapid disbursements in case of urgent needs arising in the Spanish banking sector." The first actual disbursement would only happen in November. By then, the Spanish government will have established how much money the banking sector needs, after the conclusion of bank-by-bank stress tests. The estimated amount of this disbursement is €45 billion (i.e. the initial €30 billion plus a further €15 billion). 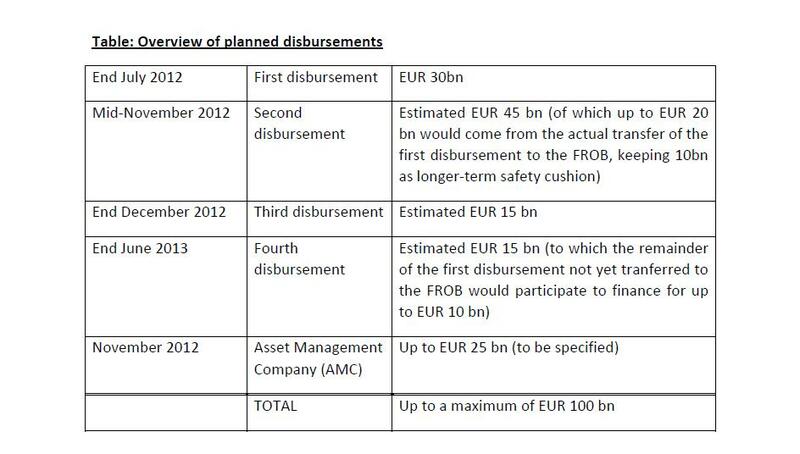 Two more payouts - worth €15 billion each - would then take place in December 2012 and June 2013 respectively. All the disbursements are expected to be provided in the form of EFSF bonds. The EFSF has also released a new FAQ on the Spanish bailout and the two documents combined raise some interesting questions. The first if over how the loans will be provided - whether in cash directly or in EFSF bonds. The docs suggest the latter for the most part, although it is worth noting that the third disbursement (€15bn) may be used to purchase 'convertible shares' of banks which had aimed to raise money privately, but are struggling - this means that direct cash loans will be needed. Second, if much of the bailout will be issued in the form of EFSF bonds, meaning no market issuance, how will the interest rate be calculated? This remains unanswered, although we'd hazard a guess that the rate may be based off similar issues by the EFSF or an implied market rate. On top of this the documents also fail to shed much light on the issue of ultimate liability. The state will remain liable for the loans while they come from the EFSF. However, once they are transferred to the ESM (and therefore count as loans directly to banks) it is not clear if they will still be liable. Germany has made it clear it wants to maintain the sovereign backstop, however, the peripheral countries and the Commission seem less keen. It's been a week of interesting developments with these documents and the draft Memorandum of Understanding also being released. Unfortunately, the overall picture remains hazy. With details and the package as a whole expected to be finalised at the next meeting of eurozone finance ministers on 20 July, there remains plenty of questions to answer. 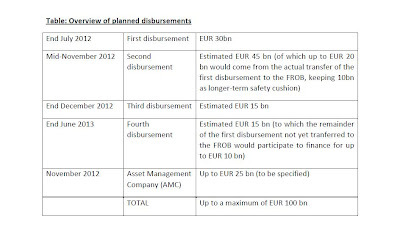 Clearing up a point above, as the table shows and as is mentioned in the comments, the €45bn disbursement will carry over €20bn from the first disbursement (as opposed to the full €30bn as suggested above). The remaining €10bn from the first disbursement will be carried over but will continue to be held in reserve until the fourth disbursement. You got the mid Nov (second) term not correct according to the table at least. It is 20 Bn from original and 25 New (iso 15). Fourth is 15 minus 10. That would make the total 100 Bn 30+25+15+(15-10)+25. Clearly looks like the ultimate guarantee question is still open (or has been reopened). It looks imho most likely that the Spanish state will still guarantee the loans. Otherwise again a parliamentary procedure would be necessary in Germany. More delay and more chance on a unwelcome decision. Furthermore Holland and as I am correct Finland are the opinion that the 85% emergency clause is not applicable on direct bank assistance. Especially with Finland this is risky. Anyway it will most likely be done in a way that it is not increasing the Spanish debt at least formally. I donot see markets making much difference compared to a direct loan to Spain. De facto it is the same as if the banks cannot repay loans routed via the Spainish government or one of its institutions. Spain has a problem in both cases and roughly the same one. Another point is transferring regulation. Now it looks done in a way as if a health insurance company accepts cancer patients because they can decide who treats them. The fact that there are at this moment huge problems in the Spanish banking sector is the main problem not who does the regulation. Huge political problem as well. helping banks is as popular as the plague. Foreign banks even more. Routing via Spain (if necessary by way of a guarantee) makes things a lot easier to explain at home. Fully agree the amount looks too low. It is not only about cleaning upo the present mess. It is also about having enough buffers to be able to survive likely very bad scenarios. The last point is simply totally ignored. Buffers for normal situations are applied. But this is not a normal situation. Lot of huge downside risk. Recession, mass unemployment, still lot of air in real estate prices, heavily overexposed to sovereign junk bonds. All this makes a downside risk several times more likely to occur than under normal circumstances. For mainly Northern political reasons help to the banks should be made under businesslike conditions. 3-4% stuff as some in the financial sector are hoping for looks totally politically unacceptable. Even when it is routed via Spain. Furthermore several will likely go belly up so you need profits on other ones to compensate that otherwise you end up with a rest loan at the end. Flexibility could be paramount (plus likely a sort of nationalisation legislation). Circumstances could differ from bank to bank you have to be able to adjust to that. Basic some sorrt of convertible with the possibility to adjust. Convertible as it combines low direct interest, speeds things up compared to equity, leaves a substantial part of the proceeds in case of success with the investor. -for EZ not EU, the latter is totally unrealistic and would cause huge delays. It is about having a coherent policy for the EZ zone not about EU politics. -Also for smaller banks. Usually they move in herds and 10-20 small regional banks are the same size as a systemic one. Furthermore in several countries there is a lot of political stuff going on there that should be stopped as it is much too risky (eg in Spain). -Not in Brussel. You first of all need good people in the EZ they are only in Ffurt. Hiring would be much more difficult. Only other alternative is not-EZ London. -ECB does it possibly together with EBA. The only ones that have already parts of such an organisation in place plus the manpower coming with it. Other options will cause most likely huge delays. EFSF is not yet fully 'manned' bankregulation is a) much more difficult/complex. and b)needs much more qualified manpower. - Timing by the end of this year is completely unrealistic. ECB idea of one year more is already rather optimistic imho.